.MSG files are Outlook email messages. Here’s how to open msg files if you don’t have Outlook. Microsoft Outlook emails that have been saved outside of Outlook are formatted as msg files. They contain all the information that is pertinent to the email, including the message, file attachments, To, From, Subject, internet header, sent time and date, received time and date, and hundreds of other pieces of information (MAPI properties) that are typically not visible. Pst Viewer Pro is a Windows software application that can open all types of Outlook email messages including .msg files, .pst and .ost files. 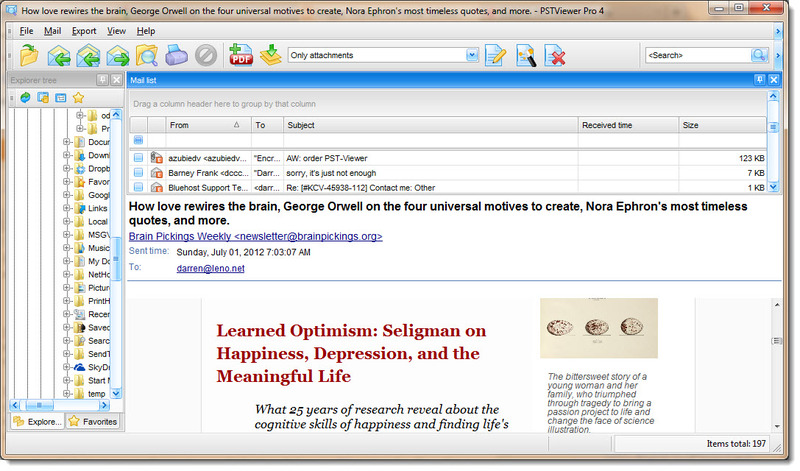 Pst Viewer Pro lets you view a directory of email messages by organizing them in a viewing pane. You can sort the emails by date if you wish and browse through them individually. You can also search the messages by many different criteria to find the specific emails you want to read. 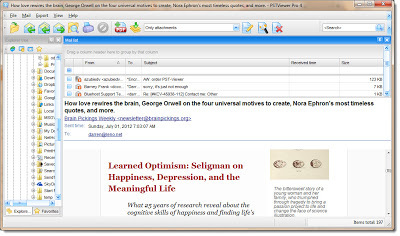 Pst Viewer Pro gives access to email file attachments stored in .msg files. You can open attached files by double clicking on them. Save a copy of the file attachments by simply dragging and drop them on your desktop. First, select the .msg files from the mail list window. Control-A will select all messages in the list. Next, choose “Extract Attachments” from the Export Window. Click the Export button, and select the folder where Pst Viewer Pro should save your files. If you want to archive your Outlook .msg files to a more common and easily managed format, PstViewer Pro can convert them to PDF format. There are three basic modes for converting MSG files to PDF. “PDF-attachments embedded” will include email file attachments as separate files within the pdf document. 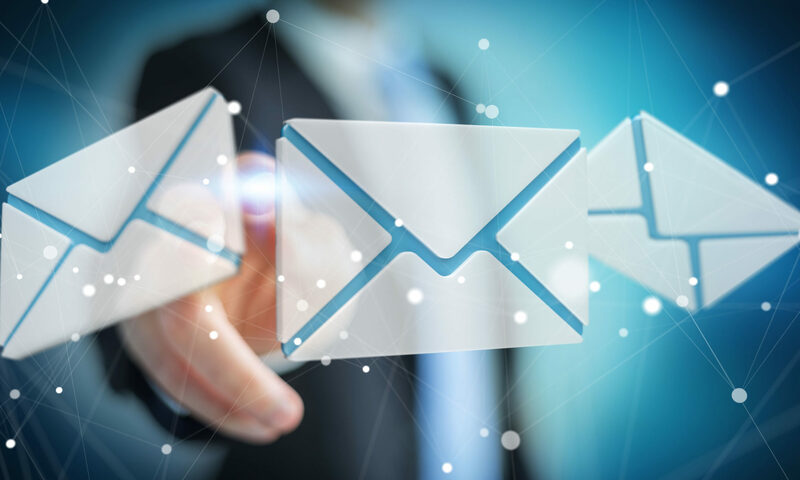 They can later be extracted from the pdf file, but this method preserves the context of the attachments by keeping it associated with the email message. “PDF – attachments converted/included” will convert most document file attachment types into the PDF image. This method prevents attachments from being extracted as separate files and edited. “PDF-attachments saved to disk” will convert the message to a PDF file, while copying the file attachments from the email and saving them to a folder on your hard drive. Try PstViewer Pro free for 15 days! There is no risk. If you choose to buy the software, you’re protected by a 30 day full refund of the software purchase price.